After a great stint at Bengaluru, the Frozen Bottle has finally ventured in to Pune and is bottling up some mouthwatering sweet fix for us dessert lovers! Ever tried a nutty choco jumbo ice cream or an Oreo cheesecake in a bottle? At the Frozen Bottle on FC Road everything gets a twist INSIDE A BOTTLE! We recommend you try the choco fererro rocher for INR 199, the death by chocolate sundae for INR 155 and the irrestible litchi punch for INR 140. Love fruity flavours? Must-try their garden strawberry, banana caramel and kiwi krush in a bottle, starting at INR 135. Ice cream lovers, get a jar ful of red riding hood, a combination of red velvet cake, salted caramel, nuts and ice cream for INR 150. What’s more? You can also make your own milkshake for just INR 199! 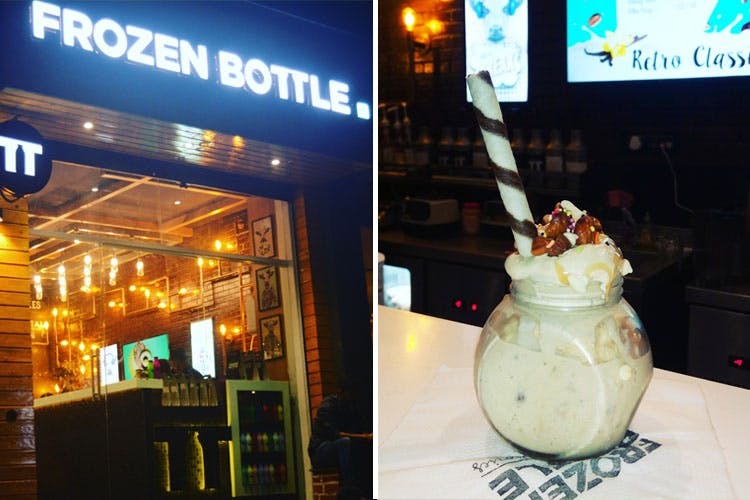 An abundance of flavours and twists inside a ‘frozen bottle’…Don’t you wanna try?